PREMIERE ESTATE PROPERTY. Located on pastoral BROOKLEIGH RD, the gently sloping acreage features a sun drenched SOUTHERN EXPOSURE. 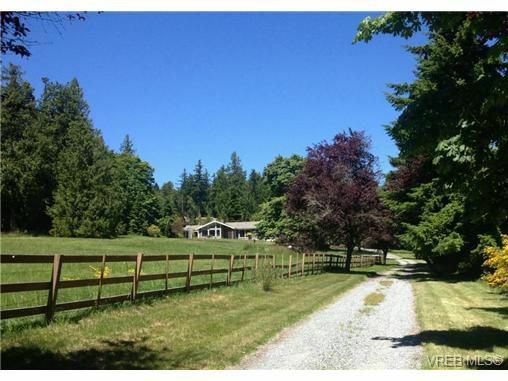 This arcadian location is just steps to ELK LAKE, walking & HORSE TRAILS, yet mins to downtown Victoria & airport. The West Coast inspired 5 bed, 4 bath home has been completely modernized w/brand new kitchen, bathrooms, flooring, freshly painted inside and out... this residence is move in ready for even the most discerning homeowner. The grand open plan is purpose built for entertaining and flaunts a delightful INNER COURTYARD & luxurious master on main. The formal dining room & large living room offer dramatic VIEWS over the charming country estate. Perfect for HORSES, ORGANIC GARDENS or a VINEYARD.